Video Pinball is a dedicated video game console released in 1978 as an Atari Inc. coin-op-to-standalone home console translation, by bringing the game Breakout to home players. Bumper controllers on the sides or a dial on the front are used to control the games depending on the game selected. There are three game types: Pinball, Basketball, and Breakout. 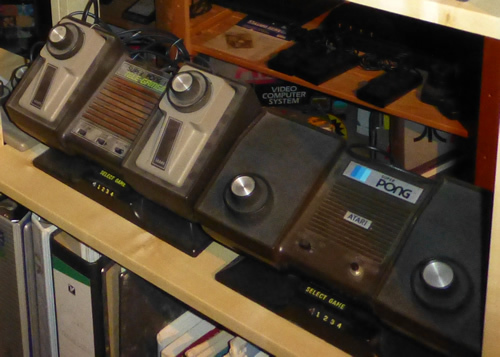 The console is based on the single chip 011500-11/C011512-05 (“Pong-on-a-chip”) produced by Atari. There were three different versions of Video Pinball over its lifetime. Atari released both woodgrain and cream colored versions as “Atari Video Pinball”. An OEM version whose name was changed to “Pinball Breakaway” was also produced by Sears under the Sears’ Tele-Games label. Touch Me is an arcade game first released by Atari Inc. in 1974, and later as a handheld game in 1978. It can be described as a Simon-like game that involves touching a series of buttons that light up and produce sounds. The player must observe a sequence of blinking lights and repeat the sequence back in the same order that it occurred. Each time this is completed, the game will produce another sequence with an additional button added. This process is repeated and a digital score window displays the total number of sound sequences a player correctly repeats. The game continues until the maximum sequence of buttons is reached, or the user makes an error.